way of corn season. My neighbor Tom and I dragged about 25 ears to the patio for shucking prior to freezing. It wasn’t yet hot enough to turn the sweet corn into popcorn, but it was getting there. However, you don’t want to do this in the house, unless you enjoy picking corn silks and shreds of green shucks out of everything in a 30-foot radius. It’s near the beginning of corn time here, and the corn will likely be a little less expensive when we hit the high season. But the biggest advantage of early corn – besides that it’s here now and irresistible – is that it’s mostly worm free. No dealing with the green crawlies and the mess they make as they chew through what rightly is mine. I don’t like to share with bugs. Another reason for confining shucking to the yard is that stripping kernels from the cobs will make enough of a mess. I’ve found splatted kernels on light fixtures and the coffeepot before, when the carnage was over. Tom freezes corn both on the cob and off. I prefer it off the cob, because that’s more versatile. When it’s 40 degrees and raining – as it will be in not that many months – the summer corn can bring sun into chowders, corn puddings and muffins. If you plan to freeze corn, you should blanch it first. This means plunging the whole ears into boiling water for no more than a minute or so. Then drop the ears into a large bowl of iced water, to stop the cooking as quickly as possible. Then use a sharp knife (I don’t bother with corn-shucking gadgets and neither does Tom) to strip off the kernels. I packed them into one-pint freezer bags, because I find that’s a good amount for recipes for The Hub and me. Need more? Just thaw out more bags. Be sure to squeeze out all the air you can when packing the bags. I ended up with a short bag – not really enough to freeze. That I turned into a salad for lunch. With the corn already shucked, I threw together the salad in 30 minutes, then chilled it for about an hour. This would be good rolled in a tortilla with some feta, too. 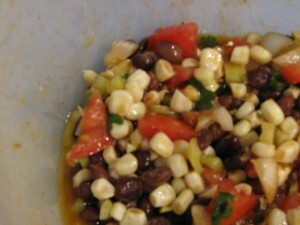 In a large bowl, toss together the corn, black beans, onion, banana pepper and tomato. In a small bowl, whisk together the olive oil, lime juice, vinegar, chili powder, salt and pepper. Pour the dressing over the vegetables and toss to coat them all. Stir in the cilantro. Refrigerate for at least an hour to let the flavors come together. In thanks for a favor that I was more than glad to do, a neighbor left a dozen ears of corn on my doorstep. What to do, what to do…. I didn’t have time to start freezing it, and I’m trying to keep the freezer light – we’re having work done on the house and it might have to be unplugged at some point. The fresh flavor of boiled ears is fine, but I was in the mood for something different. I saw a fabulous display of peppers at the State Farmers Market, and decided to put the two together in a quick saute. I purchased some sweet Italian peppers and some hot cayennes. At home, I took the kernels off four ears of corn. I chopped up half of one cayenne and about three-quarters of the Italian pepper (both were large peppers). I tossed it all together with a little salt and pepper and a chopped clove of garlic. I added some salt and pepper and, at the last minute, some dried aleppo pepper – I love its mildly spicy, slightly smoky flavor. After a few tablespoons of olive oil heated in a large saute pan, I tossed it all in. Stirred and fried for a few minutes, until the peppers turned color and the corn liquid was mostly gone. I chopped up five or six leaves of fresh basil from the backyard, removed the corn from the heat and stirred it in. The basil fragrance was just the touch the dish needed. I served the dish at closer to room temperature than piping hot, and it was just as good. And not bad reheated the next day, either. You’d expect a certain level of elegance at picnics held before North Carolina Symphony outdoor concerts. Food matched to concert themes, shrimp with horseradish, silver candelabras. Read about it in The News & Observer (Raleigh, N.C.) here. If the concertgoers tried a little harder, they might reach the level of an Ole Miss football tailgate. Corn strippers. No, not entertainers who peel off their husks. They’re essential for serious corn-from-the-cob removers. Read more in the Charlotte (N.C.) Observer here. You’ve heard of eat local, now you can sauce local. The Independent Weekly has a colorful collection of local barbecue sauce makers. The pineapple and garlic in The Shizzle Jerk Marinade is quite intriguing. Read more here. Vegan food in a slow-cooker? How crazy is that? Well, not very if you read HealthySlowCooking. Since I’m scanning the skies for dairy-free desserts for The Hub, who is allergic to dairy, this is a good find. Ever wonder what happens to coupons after they accomplish their mission to save you money? The Post and Courier (Charleston, S.C.) has the interesting answer here. Boil before grilling? If you’re thinking about brats, the answer is yes, according to Bill Daley in the Chicago Tribune. Read the reasoning here. Until someone manages to produce a bacon plant, we’ll have to make do with NCTomatoandGardenBlog by tomatomaniac Craig LeHoullier. Read through the list of plantings and drool. The stack of corn in my freezer is smaller, but still there. Little bags of white-gold reproach, they are. To go with our Memorial Day burgers, I used some to make a corn and black bean salad. The corn had a lot of liquid in it, so I heated it in a non-stick skillet, stirring, until the liquid was gone but the kernels were still moist. I mixed about a cup of the corn with a can of black beans, which I had rinsed and drained to remove some of the salt. I always do that with canned beans. Some chopped Vidalia onion and green bell pepper went in, too. Cilantro would have been nice, but I didn’t have any. I concentrated on getting a lot of flavor into the dressing. I mixed olive oil, oregano, thyme, salt, black pepper, garlic, red wine vinegar, a squirt of lime juice and my secret weapon, homemade hot pepper vinegar. I threw in a few dashes of chili powder and smoked paprika, too. I poured the dressing over the vegetables and refrigerated it all for about five house, giving it a shake occasionally. The sweet corn and the other flavors worked out just as I’d hoped. If you’ve never made hot pepper vinegar, it’s so stupidly easy. Get a scrupulously clean jar and enough fresh hot peppers to fill it up. Pour in white wine vinegar. Add a couple cloves of garlic, if you want. Sit the jar, covered, in a cupboard for a week or two, or until it’s hot enough for you. Leave it as is, or decant into another, more attractive bottle and toss in some of the peppers. Done. You people think you know something about excess corn. Over on Facebook (yes, I’m over 50 and use Facebook, which means it must be passe) people have had a lot to say about my recent Sunday Dinner column. By the way, I will not load up a cooler and distribute excess frozen corn to people just because they ask for it. I received several suggestions for creamed corn, despite the fact that I clearly stated that I needed non-dairy uses, thanks to the Hub. And to Bill D., I did force the Hub to undergo food-writer premarital testing, but he must have faked the results. Happens on “All My Children” all the time. Bacon is non-dairy, which makes this recipe offered by Mark Hutchinson suitable, provided I use non-dairy margarine. Here it is, exactly how he wrote it. 1. Fry a rasher of bacon until crispy. 2. Set the bacon aside to dry. 3. Add one large (29 oz) or two regular size (15 oz) cans of drained whole corn to the pan with the bacon grease – in this case, Debbie would shuck enough ears to equal this volume. If the bacon was particularly fatty, you might pour off some of the grease before adding the corn. 5. Keep stirring the corn as it fries. 6. When the corn has caramelized, drain excess grease. 7. 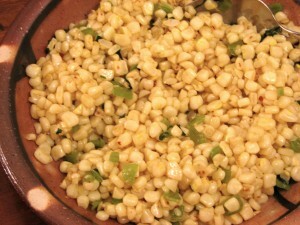 Move the corn into a bowl/dish – helps if it is microwavable.